Have you ever said something and then as soon as you said it or a little later wished you could take it back? whether its because you git in trouble, were embarrassed, or realized you had hurt somebody its all the same, you can never take back your words. Its like a bottle of toothpaste if you squeeze some out you can never put it all back in. No matter how hard you try. That is something we did when I was little whenever we said something mean, or were talking about words. Words can build you up, or words can build you down…think about the things people have said to you, some of them can tear you down like if someone calls you ugly, fat, stupid any of that. Or some can build you up being told your beautiful or smart whatever. 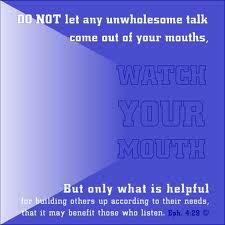 Ephesians 4:29 Says “Watch the way you talk. Let nothing foul or dirty come out of your mouth. Say only what helps, each word a gift” So each word you say you should try to build others up not tear them down. Unless it points the world back to You” So with every word we speak not only should we build others up, but we should point the world back to God.